Thank you @Noobly . @DancShares i got it, thanks. Today, Today I want AXL to soar! @groovy I just saw a tweet about AVI so I looked them up. My gosh man, we should have bought some assuming you haven't already? 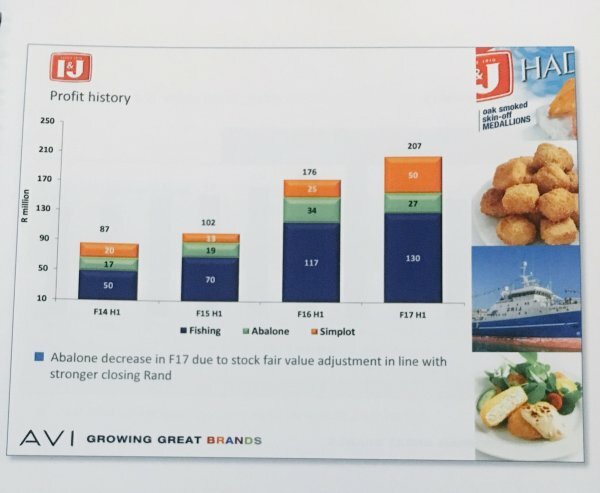 Look at this, this is the I&J breakdown, I had no idea it is this big, surely giving Sea Harvest a go. @Spreadsheet Ranger I don't own any AVI shares, i've never looked at them at all. How did we miss this though, i&j all up in our faces wherever we go, i didn't know they were really this big, this is "YUUGE". I'll pass on sea harvest, i read their SENS yesterday, and lost my appetite, i don't want their fish. Totally agree dammit there is so many good companies on this jse that flys by unnoticed. I think I might skip on sea Harvast as well. I mean technically I&J is actually bigger than sea Harvast it seems should they separate from AVI and operate on their own. What a spot there in twitter groovy, AXL in acquisition talks I'm curious now whether they want to acquire someone or of it is them Axl being acquired. haha, i see you Ranger!!! I hope it's positive for us, we believe in the Phoenix, come on!!! Break that 70c resistance . It's so cool, i've just checked it out. IG is a veteran in this, the info + layout is just clear, i love it. Thanks for the heads up Ranger. I think I'll need to go hang out in the how to make extra income thread. I need more money, so many stocks I want to buy!! So little funds to own it all. I see steinhoff is being murdered. I wonder what's happening there? I've never used IG - where on the site do you get this info?? Do I need to register first?? Oh sorry I read my post see I forgot to add the second link. So IG has a hell of a lot more I'll try to get a screenshot now now. 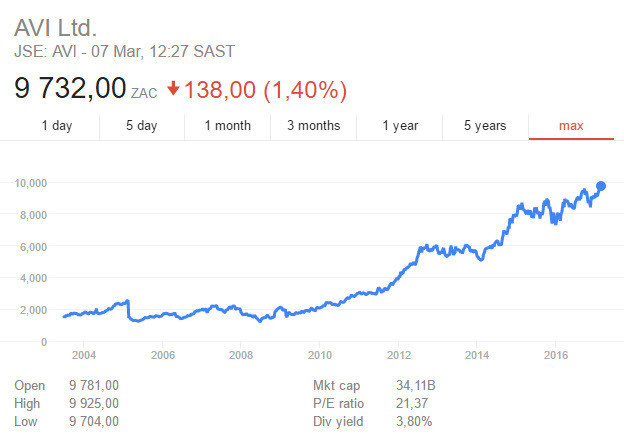 Just Google AXLJ or add J at the end of any jse stock code and investing.com should be the first link. Then click fundamentals or the other tabs for respective contents. 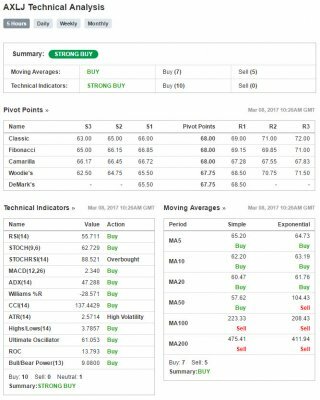 It looks a bit different today, one place says SELL, and right under it it says STRONG BUY. I'm a actually also confused by what those means exactly, especially wtf if they say sell. I sell and then they say hold. Defuq am I suppose to hold? I just sold it remember. Perhaps @SimonPB can shed some light on how buy hold sell indicators should be interpreted. Stop it! Stahp. Leave AXL alone. Kidding. I think looking slightly longer (compared to ranger's rich by friday short term), buying AXL under 80 cents still provides significant potensial in the next 12 - 18 months. How much I do not know, but R1.30 - R1.80 does not feel impossible to me. Everyone here yelling go AXL go, and here i am staring at the bottomless pit that is my DRD share profile.... FML, if i ever get out of this, a bottle of the finest Moët wouldn't be enough. When this forum started I decided to buy a few ETFs to use as examples, well... Still mostly red. I just did this for STXIND, and for some others that are in my TFSA (I know this isn't the TFSA thread...), since I added to it yesterday. Urg, such low volumes on AXL again. No news about Taste Holdings perhaps anywhere, dying to know what is going on there. How do you check die volumes? Is it the chart underneath the google finance one? 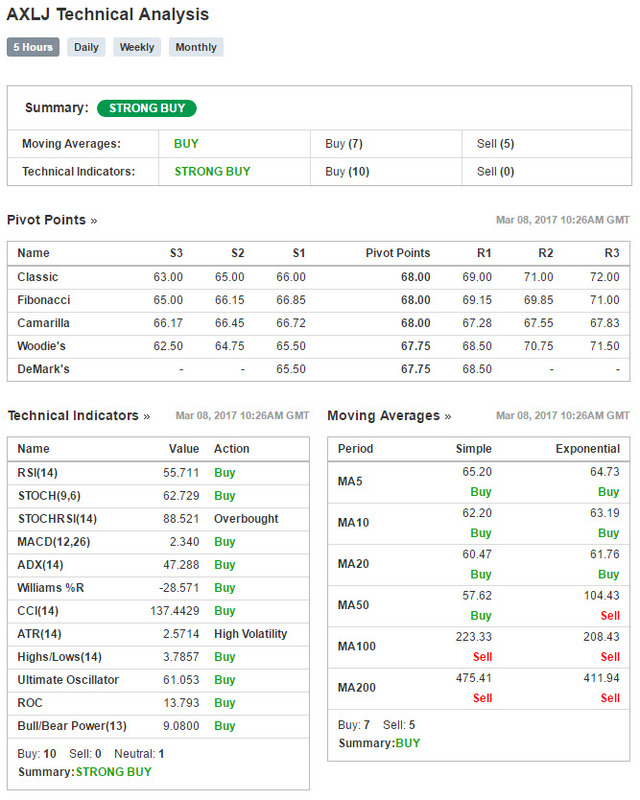 Also how does it work, is it showing shares sold/bought/available?